What Does an Art Museum Director Do? An art museum director is an expert in understanding the museum's mission and collection. With this expertise, the director leads and manages the museum. An art museum director is a curator, director, and business manager all rolled into one. There are no tools per se, but rather professional skills, education, and experience are the requirements for this job. The museum director is responsible for all aspects of operations including budgeting, fundraising, and financial controls, programming and exhibition development, and maintaining and researching the collection. Staffing operations: The art museum director is responsible for running the museum which includes planning, organizing, staffing, funding and directing the museum. Financial operations: A museum director typically oversees all levels of a museum's operations such as its annual budget, financial and fundraising aspects, plus exhibition planning, programming and development. Visitor and donor services: A director also oversees the various departments such as visitor services, education, sales, marketing, and manages the museum staff which may include conservators, curators, preparators, and others. An art museum director salary varies based on the level of experience, geographical location, and other factors. Education: Art museum directors have at least a graduate degree in fine art, art history or museum studies. However, a doctoral degree on the museum's specialty or two graduate degrees is quite common in this competitive field. Experience: To be hired as a museum director typically requires several years of museum management experience. One way to acquire such experience is to start off at a small regional museum to gain experience and knowledge. Business skills: A museum director should have supreme managerial, financial, and business skills, as fundraising is a big part of the job. 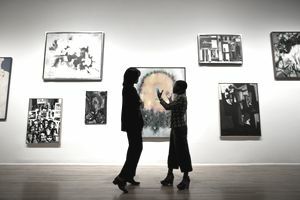 Communication skills: A museum director must be a skilled communicator and mediator in order to work well with the museum's board or governmental overseers, its staff, donors and sponsors, and the public. According to the U.S. Bureau of Labor Statistics, the outlook for art museum directors and curators over the next decade relative to other occupations and industries is strong, driven by an increased need for information and records to be accessible and organized. Employment is expected to grow by about 13% over the next ten years, which is faster growth than the average for all occupations between 2016 and 2026. This growth rate compares to the projected 7% growth for all occupations. Depending on how big an institution is, an art museum director may spend their day working at a desk or out on the floor, interacting with the public. They may need to climb scaffolding or ladders to access parts of exhibits or lift heavy or bulky items for displays. Art museum directors mainly work a full-time schedule, during normal business hours.Larger organizations may require them to travel to assess potential additions to the museum's collection. Additionally, if an exhibit is open on the weekend, the museum director may be required to work during those hours. Look at job-search resources like Indeed.com, Monster.com, and Glassdoor.com for available positions. You can also visit the websites of individual museums or visit them in person to apply to existing job openings. Look for an opportunIty to do volunteer work through online sites such as VolunteerMatch.org. You can also contact various museums directly and volunteer your curatorial technician services. Prepare a resume that is geared specifically toward any specialty areas in which you have advanced knowledge, such as African studies, that is relevant for the position you seek. Many jobs are available at universities and colleges. Attend events sponsored by the schools or approach personnel at the museums directly to inquire about potential positions.